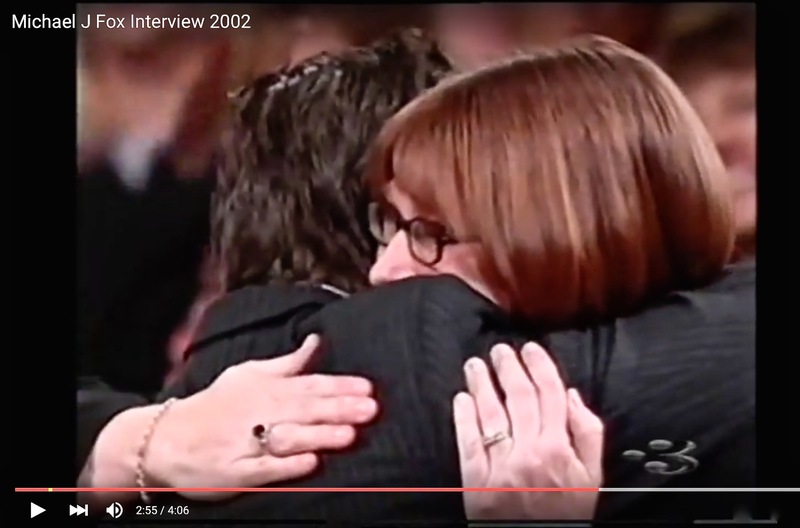 Have I mentioned I was on The Oprah Winfrey Show & that I got a hug from Michael J. Fox? Point is, I knew way back, before 2002 when Oprah interviewed Michael J. Fox in regard to his 1st book, Lucky Man (& I ended up there in Chicago as a part of that episode) that one day (somehow) I would have to say Thank You in a Texas-big fashion for the difference Michael J. Fox had made in my life. I didn’t know what I’d do or how I’d manage, I just knew that I had to do something, and I knew that I would. I still get emotional & overwhelmed (in the best kind of way) whenever I remember those moments & reflect on how much it mattered, how much it meant to me, that Michael J. Fox got up out of his chair, came off the stage & hurried down those steps to embrace me. The memory, the fact of it, continues to uplift, encourage & restore me. I know it may sound kinda-silly or overly dramatic, but I nonetheless assert that Michael J. Fox pretty much convinced me to marry Gary while the proposal was still on the proverbial table. 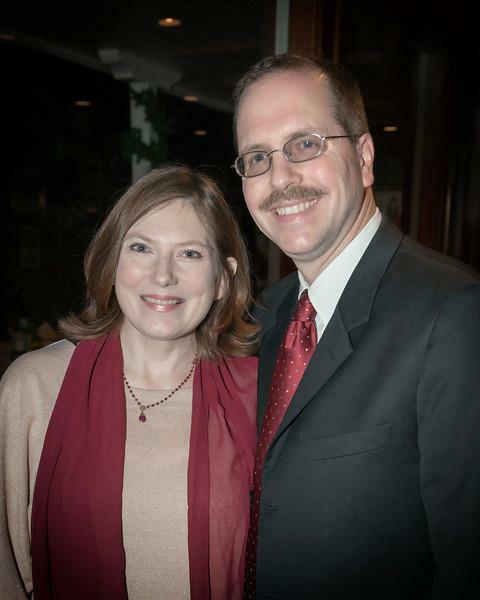 Which is why, on every anniversary of Gary’s & my marriage (sixteen & counting), I send out a Woohoo-Yeeha-Thank You! to Michael J. Fox. Because it’s quite possible that without the changes I made in my life & in my self due to Michael J. Fox’s inspiration & example, I wouldn’t have “righted” myself in time to keep Gary in my life, wouldn’t have recognized I was worthy of being his (or anyone’s) wife – as in, good enough just the way I am. To be clear, I’m not in any way suggesting that one need’s a spouse to be “complete,” to be “happy” or in order to “live life to the fullest” – re-visioning myself as not-less-than because of illness & disability would’ve changed everything regardless of my life-partnership-status. Timing, though, as they say, is everything. And before the diagnosis of MS, I’d not have hesitated to leap into a future life as Gary’s wife. Which is why in this story, my story, the difference in how I saw myself & my life with MS, in the light of the way MJF was living his life with Parkinson’s – that transformation happened at a time when huge life decisions were needing to be made. Like joining my life with another’s. Sure, some things are different when one partner has a chronic illness, a lot of things in our lives are no-doubt more challenging. But with or without MS, I am still me: capable of loving completely & being loved completely in return. There is no disease, no kind of difference in ability (or disability) that changes who I am, my worth, my heart’s allegiances & capacity. Everybody always tells me how lucky I am to have Gary, and they are right: I am lucky. Interestingly, though, no one has ever, not once, said to me that Gary is lucky to have me. Which I think speaks a lot more to how our society views illness, differing levels of ability & disability, than it says about my husband or me. Gary & I, we are lucky to have each other. That, I know for sure. The 2015 NYC Marathon with Team Fox is especially dear because it’s a Life List Goal that’s been “on the books” for a long time, because it’s a Thank You for inspiration & motivation that changed not only how I look at myself & what I’m capable of, but how I view what’s possible. When I look back over everything I’ve done in my life up until now, the things that feel as if they made the most difference, the accomplishments I’m most proud of, almost all of those things happened because of the way I responded to the inspiration & motivation of others. Michael J. Fox is not the first or the only person to inspire me, but he is the person whose story intersected with mine in a way that made me realize I had – & continue to have – the power to write, direct, change, take charge of & drive my own story. I’ve done my best to pass everything on, whenever & wherever possible. Even this blog (that I doubt many people ever stumble upon, much less read an entire post), is a part of my efforts to continue paying forward all of the inspirational, motivational, door-unlocking-goodness I’ve received from others. Which is no small feat when you take into consideration that I’m not even – by nature, anyway – an optimist. I’m largely a realist, and the part of me that is not a realist just happens to have a remarkable imagination (for both better, and worse). I’m often able to list the most amount of reasons why something cannot or will not work in the least about of time. If there were an Olympic event or a prize for Worst Case Scenario Envisioning, I’d so grab the Gold for the USA. 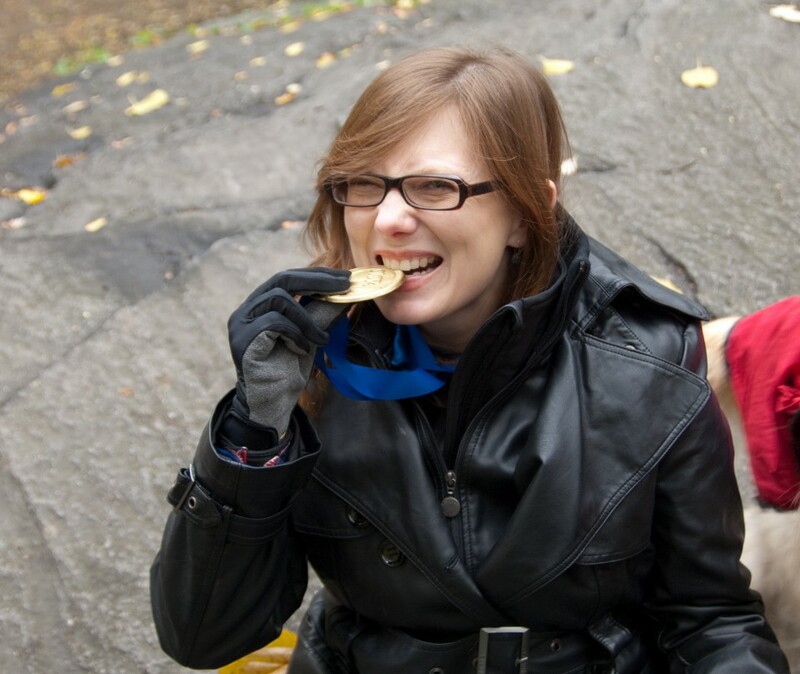 Okay, in this photo, I’m actually biting my 1st NYC Marathon Finisher’s Medal to make sure that it’s real – but this is basically how I’d look if I won that Worst Cast Scenario “Envisionor” Gold Medal. Even though I know I’d totally outdo any competition in my field, I’m so not-an-optimist that I’d still feel the need to double-check that I wasn’t being punked in my victory. I’m not a pie-in-the-sky, we-can-do-anything-if-we-just-try-hard-enough kind of person by any means; I am absent of those genetic predispositions. I am a hoper & a dreamer, in the sense that I love stories, so I love to imagine things & I love to imagine them the way I want them to be. I love to imagine myself as doing good, doing better, making a difference. Believing my dreams can come true, achieving goals – I had to learn that. I learned by listening to other people’s stories. I learned by bearing witness to the way others live their lives & accomplish their goals & snag their Big Dreams. When I hope or wish or dream a new thing, my initial instinct is always that I don’t deserve it, that it will never happen, that I’m the worst of fools, that there’s no way in heck the thing could ever possibly be made real – maybe for somebody else, but not for me – who am I to dream such big dreams, set such “unreachable” goals? I have to keep telling myself the wish-goal-dream story, over & over, revising & re-envisioning. Sometimes I still can’t find a way through to the end that I hope for with even my best & most creative imagining. But I keep circling, I keep looking with new eyes. I keep circling & circling until I can see an “in,” a first step, a way to begin to envision the hope of possibility. Nothing about dreaming big & “going for it” comes naturally for me. I work on it constantly, and a lot of the time I fail miserably. But I keep at it. I’m stubborn that way. Lately, I’ve been more than a little down on myself for not raising more money, because this – my taking-action pay-it-forward – matters so very much to me. My health has not been cooperating (to say the least), hasn’t allowed me to pursue fundraising with the kind of “out-loud” vigor that matches my level of devotion to the cause. I feel as if I’m letting myself & Michael J. Fox (who doesn’t even know how much this thing matters to me) down. When I commit to something, I mean to give it everything I have, I want to do the thing “right.” When I feel like I’m unable to do my best because my health is holding me back, that’s when The Lie (that I’m not worthy, that I’m less-than) starts knocking on the door again. I keep trying to shut it up & shut it out. I keep telling myself that I’m doing the best I can under the circumstances. I keep circling; I keep looking. I keep steering the story toward the destination, keep trying to drive myself to The End that my heart feels drawn toward. That snip of video footage is a living-color reminder of how much I have to be grateful for, as well as the reason I am compelled & convicted in this quest to pay-it-forward. I’ll keep holding out (perhaps foolish) hope that I’ll raise about $5,000-ish dollars between now & November 1st, when I ride in the NYC Marathon with Team Fox. You have to admit, crazier, wilder, more unlikely things have happened … I mean, I was on The Oprah Winfrey Show! And Michael J. Fox HUGGED me!!! That seems like pretty good proof of Anything Is Possible. See? Told you my service dog’s cute. And totally rockin’ that Team Fox hat. 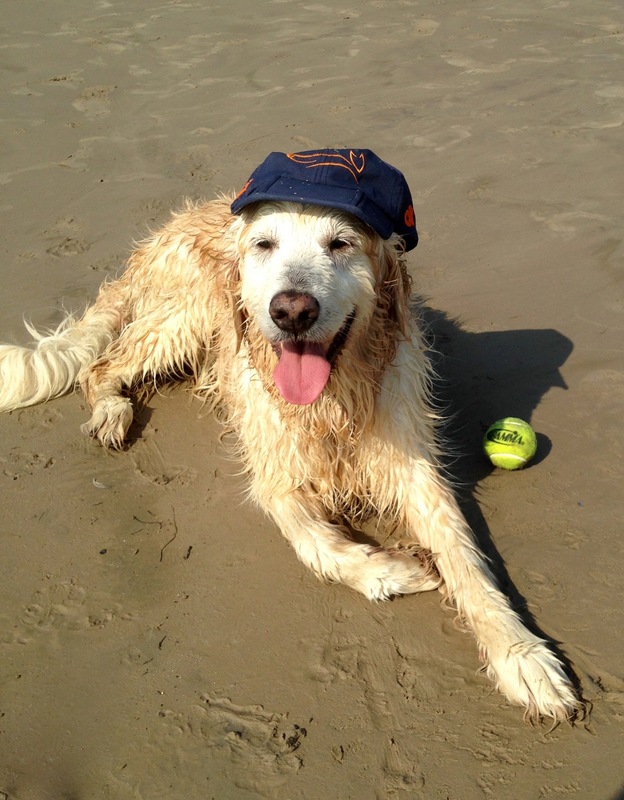 PS: Luke thinks he’s the official mascot of Team Fox (I have no idea who gave him that idea). Please don’t burst his bubble. He’s very proud of being chosen to represent. In Luke’s mind, he is the running fox of the MJFF Team Fox Logo. And to that end, I am choosing November 1st, the Big Day of the 2015 NYC Marathon and the manifesting of my Big Pay-It-Forward Dream (to MJF) as the day that I will sponsor every mile that you ride and I ride, combined, to contribute to your Team Fox fundraising efforts. Wow!!! That, my friend, is AWESOME!! Your words and your action really mean a great deal to me…the as you know, the funds mean a great deal not just to me but to #TeamFox as a whole.